Contracts are the cornerstones of various business and financial relationships, as they stipulate the terms of the relationship and typically provide certain protections for both parties. 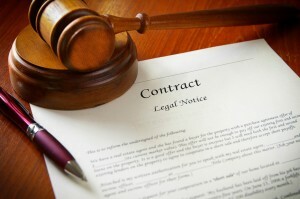 However, when contracts are poorly written, when any party is in breach of contract or when other disputes arise, a decisive, quick and cost-effective resolution to these contract disputes can be essential to preserving the parties’ relationship and minimizing the costs for all parties involved in the dispute. Denver Contract Disputes Attorney Thomas E. Downey has been helping businesses and individuals resolve various types of contract disputes since 1983. Best possible resolution to their contract disputes. Resolving real estate contract disputes, such as those pertaining to commercial leases, real estate fraud allegations, misrepresentation, etc. Ensuring that our clients are able to obtain the judgments they are ultimately awarded (by, for instance, helping our clients garnish other parties’ wages or perfecting liens on their property). If you need help resolving a contract dispute or any contract issue, contact Denver Contract Disputes Lawyer Thomas E. Downey today. Since 1983, Thomas Downey and the other legal professionals at Downey & Associates, PC, have been providing individuals and businesses in the Denver Metro Area and throughout the U.S. with the highest level of legal service for their contract, business, litigation and real estate legal issues. Our unwavering commitments to our clients, along with our extensive experience handling complex matters of contract law, means that our clients can always trust that we will aggressively protect their rights and help them achieve the best possible outcomes to their imporant legal matters. When you choose to work with our Denver contract disputes attorney, you can rest assured that, at every stage of the legal process, your case will be handled with expert care and attention and that we will work tirelessly to help you resolve your case as favorably and efficiently as possible. We welcome you to attend an initial consult to learn more about your rights and options, as well as our various services. Set up this meeting today by calling us at (303) 813-1111 or by emailing us using the contact form on this page.